HCM City (VNA) - Demand for organic farm produce has increased significantly both in Vietnam and globally, and this offers good prospects for businesses investing in the field, a seminar heard in HCM City on May 12. Wouter Van Ravenhorst from Control Union, an international inspection and certification agency, said demand for organic food in the US and EU is growing by 10-15 percent a year and likely to continue to do so. Globally, organic agricultural land increased significantly between 1999 and 2014 but not in Asia, including Vietnam, meaning there is a lot of potential for the region to invest in it, he said. Nguyen Ba Hung, general director of Organik Da Lat, said organic farming requires uncontaminated agricultural lands clearly separated from normal lands, the non-use of pesticides and chemicals and record-keeping to keep clear track of product flows. His organic vegetable production can never meet demand and he would to like to tie up with other producers to expand, he said. Deputy Minister of Science and Technology Tran Quoc Khanh said food safety is a top concern for all of society, and organic agriculture plays an important role in ensuring this. Organic farming is an inevitable trend globally since it helps increase productivity and farmers’ incomes and reduce greenhouse gas emissions and chemical contamination, he said. In Vietnam, organic agriculture is done on around 23,400ha or 0.2 percent of the country’s total agricultural lands, he said. There are some successful organic models such as Hoa Sua Foods organic rice brand by Ca Mau-based Vien Phu Organic and Healthy Foods Joint Stock Corporation, vegetable production by Organik Da Lat, a unique thick-skinned orange in Ham Yen, Tuyen Quang province, and others. Delegates at the seminar agreed that organic agriculture offers advantages like lack of pesticides residues, helping increase the value of agricultural and aquaculture products and having a greater likelihood of being accepted in choosy markets. But companies in the field face many challenges, they said. For instance, there is no domestic certification organisation for organic products and growers have to depend on foreign organisations like Control Union, IMO, and JAS, they pointed out. Besides, the standards for certifying produce as organic are not clear, he said. 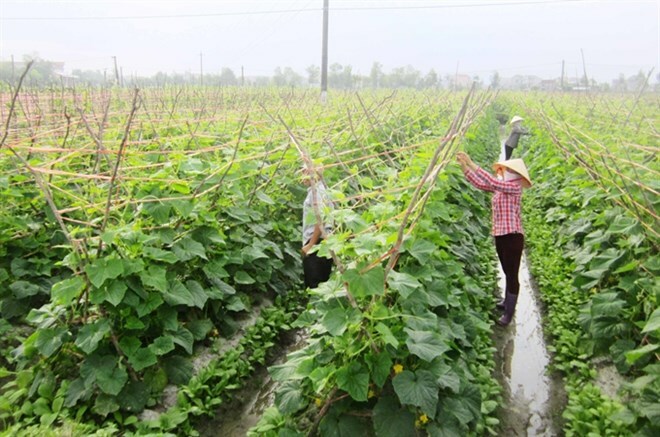 There are too many kinds of production standards like VietGap, GlobalGap, Organic, Natural, CFA (climate friendly agriculture), he said, wondering what the differences between them are and saying official agencies should clarify. The Government should have long-term policies to zone production areas for various kinds of produce to avoid contamination, he warned. To develop sustainable agriculture, the Government should have transparent, clear policies that persuade farmers to switch gradually from chemicals-based farming to sustainable, climate-friendly agriculture to cope with international competition and safeguard the health of the community, he said. The policies (land use, credit, market policies) need to be strong and distinct for farmers, enterprises, fertiliser makers, and others involved in organic farming on one hand and chemicals-based farming on the other, he said. Increasing public awareness about the production and use of organic products is also a big challenge, delegates said, adding authorities should educate people. Deputy Minister of Agriculture and Rural Development Tran Thanh Nam said his ministry would review and amend policies to boost organic agriculture. Existing and proposed free trade agreements would bring opportunities for exports, especially of organic produce, he said. At the seminar, companies and organisations, including Hưng Thịnh Co., Ltd, Binca Seafoods An Giang, Saigon Co.op, Organic Life JSC, the Trade Promotion Centre, the Institute of Vietnam Organic Agricultural Economics and Tay Ninh Department Agriculture and Rural Development signed agreements to increase production and consumption of organic produce.